As part of its Water Infrastructure Improvement Program, LADWP will replace over 6 miles of an aged pipeline with a new, seismically resilient pipeline. The extensive replacement project, referred to as City Trunk Line North (CTLN) Unit 1 and Unit 2, will provide additional capacity, greater system flexibility, and enhanced reliability to customers in the San Fernando Valley. The original Los Angeles City Trunk Line is a 72-inch steel pipeline used to transport large volumes of water throughout the Northeast San Fernando Valley area of Los Angeles. The pipeline was installed in 1914 and has experienced several leaks in the last 16 years. LADWP is preparing an Initial Study/Mitigated Negative Declaration (IS/MND) to analyze the potential for impacts associated with the CTLN project. The IS/MND is available for public review and comments now at www.ladwp.com/envnotices. Questions about the CEQA process can be directed to Jane (213) 367-0968. 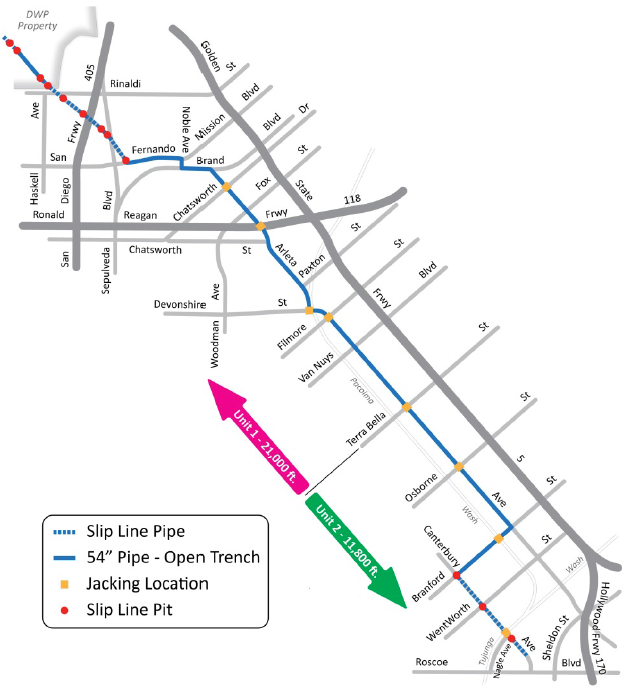 CTLN Unit 1 will be 4-miles of 54-inch Earthquake Resistant Ductile Iron Pipe (ERDIP), stretching from LADWP’s Van Norman Complex at Rinaldi Street to the intersection of Arleta Avenue and Terra Bella Street in Arleta. ERDIP increases resiliency during seismic events since the joints are designed to resist separation by allowing for expansion and deflection. Unit 1 is an 8-year project from summer 2021 through summer 2029. CTLN Unit 2 will be constructed of seismically resistant, 54-inch welded steel pipe, also suitable for the area. This 2-mile section follows Arleta Avenue towards the Tujunga Wash. Unit 2 is a 6-year project from Fall 2020 through Fall 2026. Most of the CTLN project will be installed using open trench construction. Some sections of the pipeline will be installed by jacking, a form of tunneling. Monday – Friday, 7:00 AM to 4:00 PM. Some Saturday and extended hours may be necessary. LADWP will provide advance notice within specific work areas.